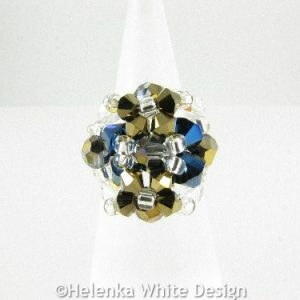 Swarovski crystal ring in metallic blue – handcrafted with clear AB polished Czech beads, Swarovski bicone and round crystals in metallic blue and dorado, and strong fireline. Fits size M/N (UK size). 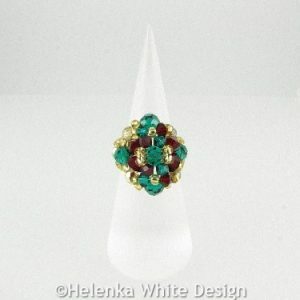 Swarovski crystal ring in emerald – handcrafted with gold and emerald fire polished Czech beads, Swarovski bicone and round crystals in emerald and siam, and strong fireline. Fits size M/N (UK size). 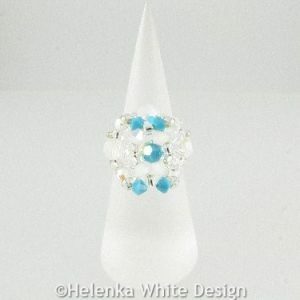 Swarovski crystal ring in opal – handcrafted with clear fire polished Czech beads, Swarovski bicone and round crystals in opal AB and turquoise AB, and strong fireline. Fits size M/N (UK size). 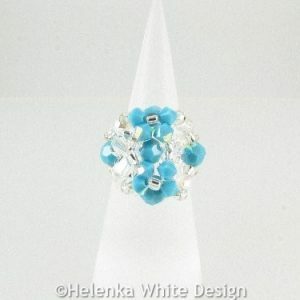 Swarovski crystal ring in turquoise – handcrafted with clear fire polished Czech beads, Swarovski bicone and round crystals in turquoise AB and clear, and strong fireline. Fits size M/N (UK size). 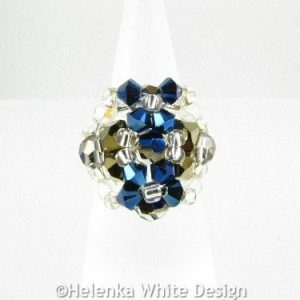 Swarovski crystal ring in blue – handcrafted with sapphire and clear AB fire polished Czech beads, Swarovski bicone and round crystals in sapphire and clear AB, and strong fireline. Available in L/M and M/N (UK size). 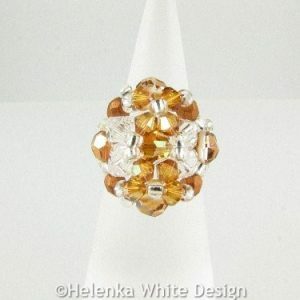 Swarovski crystal ring in copper – handcrafted with copper and clear AB fire polished Czech beads, Swarovski bicone and round crystals in copper and clear, and strong fireline. Available in L/M and M/N (UK size). 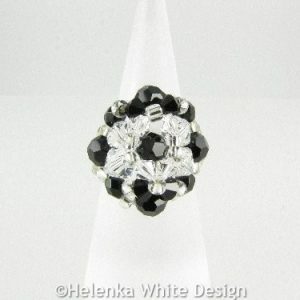 Swarovski crystal ring in black – handcrafted with black fire polished Czech beads, Swarovski bicone and round crystals in black and clear, and strong fireline. 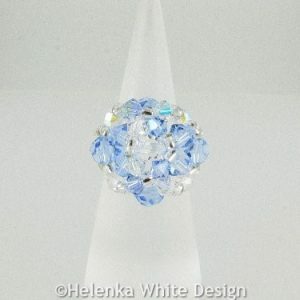 Available in L/M and M/N (UK size). 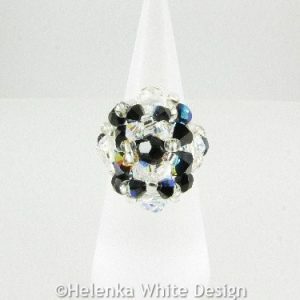 Swarovski crystal ring in black AB – handcrafted with black AB and clear AB fire polished Czech beads, Swarovski bicone and round crystals in black AB and clear AB, and strong fireline. Fits size M/N (UK size). 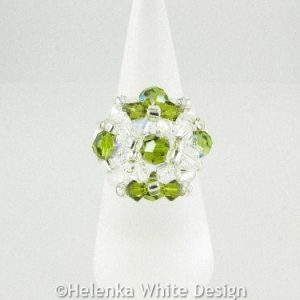 Swarovski crystal ring in green – handcrafted with clear fire polished Czech beads, Swarovski bicone and round crystals in Olivine AB and clear, and strong fireline. Fits size M/N (UK size). 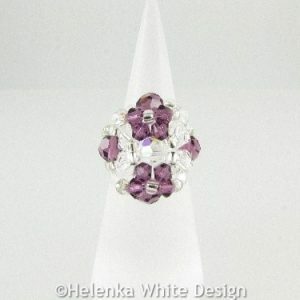 Swarovski crystal ring in Amethyst – handcrafted with clear fire polished Czech beads, Swarovski bicone and round crystals in Amethyst and clear, and strong fireline. Fits size L/M (UK size).